Anthony’s schedule of events, conventions, workshops, discussions and more, both virtual and real-world. Heya fans and readers, I’ve got 2 new events on the calendar. Please check them out, spread the word, and I hope to see you there! You know how sometimes things come together in the most unexpected ways? Earlier this year I made arrangements to attend a writer business workshop in late October in Lincoln City, Oregon. A few weeks ago, Lincoln City’s Driftwood Public Library emailed me. They saw my interview in Library Journal and invited me to give a talk as part of their Dark & Stormy Nights Author Program. And the date? Right when I’m already in town. Funny ole world. On the stormy Oregon coast, join author and freelance writer Anthony St. Clair for insights on how travel, beer, and an outlook for the world have come together in his ongoing Rucksack Universe series. Anthony discusses his craft, how he writes while raising 2 children, and his ongoing journey as an author-publisher. Sponsored by the Driftwood Library Foundation, this is the 14th year Lincoln City’s Driftwood Public Library has presented their Dark and Stormy Night author program. Free to Willamette Writers members or $10 general public. You can also join Willamette Writers at the door. 4 books… 4 authors… 1 party! When: Thursday, August 25, 6:30–8:30 p.m.
As a co-signer of author John Scalzi’s Convention Harassment Policy, I’m also glad that MystiCon has a good behavior and harassment policy in place. I can hardly wait for this event. If you’ve already gotten your MystiCon ticket, I’ll see you there. If not, I’m afraid the convention recently sold out of all its tickets. Join me and other Oregon authors at the Art & the Vineyard Festival’s Oregon Authors Table! The Festival and Table run July 3–5, and I’ll be there July 3 & July 5, 11:30 a.m.–3:30 p.m.
Now in its 18th year, the Oregon Authors Table has become a popular feature of this artsy celebration on the Fourth of July weekend in Eugene’s Alton Baker Park, along the Willamette River. 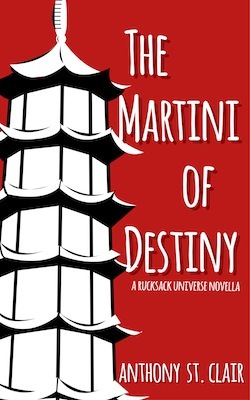 From mystery and humor, to fantasy and romance, many new local books will be featured. Among the many new books this season are Superfluous Women, Carola Dunn’s latest English murder mystery; Building a Better Nest: Living Lightly at Home and in the World, a memoir of a home in the Coast Range by Evelyn Searle Hess, and Bedtime Stories for Dogs by Register-Guard columnist Leigh Anne Jasheway. The Art & the Vineyard Festival is held along the Willamette River on the lawn of Alton Baker Park near downtown Eugene’s Ferry Street Bridge. Admission is $9 on July 4 and $7 on July 3 and 5. A 3-day pass is also available for $16. Here are this year’s authors, the times they will be attending the festival, and the books they will be autographing. Tom Arnold: Chambers of the Human Heart (a menage-a-trois novel set in Oregon) and other novels, Saturday 5:30-7:30 p.m.
A. Lynn Ash: The Route From Cultus Lake: A Woman’s Path to a Solo Camping Lifestyle, Sunday 3:30-6 p.m.
Risa Bear: Homecomings (memoir), and poems and novels, Friday and Saturday 5:30-7:30 p.m.
Jo- Brew: Oregon’s Main Street: Highway 99: The Stories, Sunday 11:30 a.m.-6 p.m.
Jennifer Chambers: The Self-Advocacy Toolbox (nonfiction about recovering from brain trauma), and other memoirs, novels and stories, Saturday 3:30-5:30 p.m.
Gary Cornelius: Dancing With the Gogos a memoir of his Peace Corps service in a Zulu village in South Africa, Friday 1:30-3:30 p.m.
Carola Dunn: Superfluous Women (2015) and two dozen other murder mysteries in her popular Daisy Dalrymple series, set in England in the 1920s, Saturday 1:30-5:30 p.m.
Pat Edwards: Oregon’s Main Street: Highway 99: The Folk History, Sunday 11:30 a.m.-6 p.m.
Jan Eliot: It Seemed Like a Good Idea at the Time (book 10 of the syndicated cartoon Stone Soup), Saturday 11:30 a.m.-5:30 p.m.
Carl Falsgraf: Highway Blues (2015, a memoir of quitting his job at age 55 to travel the country in a Toyota Tacoma), Friday 5:30-7:30 p.m.
Kenneth Fenter: Incessant Expectations (2015, a novel set in Winchester Bay, Oregon in the 1970s), and five other novels, Friday 11:30 a.m.-1:30 p.m. and 3:30-5:30 p.m.
Dana Furgerson: The Sapphire Eye and the Emerald Tooth (2015, a teen, time-traveling illustrated adventure), and other novels, Saturday 11:30 a.m.-3:30 p.m.
Diane L. Goeres-Gardner: Oregon State Penitentiary and other books on Oregon history, Friday 3:30-7:30 p.m. and Saturday 11:30 a.m.-1:30 p.m.
Quinton Hallett: Refuge from Flux (poems), Sunday 1:30-6 p.m.
Ann Herrick: Love, Life, and Surviving High School and other young adult novels, Friday 11:30 a.m.-3:30 p.m.
Evelyn Searle Hess: Building a Better Nest: Living Lightly at Home and in the World (2015, a memoir of her rustic home in the Coast Range west of Eugene, Saturday 5:30-7:30 p.m.
Leigh Anne Jasheway: Bedtime Stories for Dogs (2015) and dozens of other humor books, Sunday 11:30 a.m.-3:30 p.m.
Joseph Lieberman: Jesus: First Century Rabbi and School Shootings: What Every Parent and Educator Needs to Know to Protect Our Children, Saturday 5:30-7:30 p.m.
Karen Locke: Seal Rock (2015, poems by John Haislip), Sunday 4:30-6 p.m.
Leandra Martin: L’Landra’s Tale: A New Day for the Dauntless (a novel about people searching for a new home), and other fantasy novels, Friday 3:30-7:30 p.m. and Saturday 11:30 a.m.-1:30 p.m.
Joy McDowell: Blue Cat Shoes (2015, poems), Sunday 3-4:30 p.m.
Nancy Carol Moody: Photograph With Girls (poems), Sunday 1:30-6 p.m.
Sharon Lask Munson: Braiding Lives (poems), Sunday 3-4:30 p.m.
Keli Osborn: How to Love Everything (2015, anthology of poems), Sunday 3-4:30 p.m.
Mike Pungercar: The Promise Kept (nonfiction account of the B-17 bomber crews of World War II), Friday 3:30-5:30 p.m.
Ce Rosenow: Spectral Forms (poetry chapbook), Sunday 1:30-3 p.m.
Marie Simmons: Taste of Honey, Fresh & Fast Vegetarian, and other cookbooks, Sunday 3:30-6 p.m.
Anthony St. Clair: Forever the Road (a tale of travel, destiny, and beer set in India) and other travel fantasy novels, Friday and Sunday 11:30 a.m.-3:30 p.m.
Harriot Terry West: Into the Light (2015, poems), Sunday 1:30-3 p.m.
Rod Williams: An Americana Singer for the 21st Century (novel), Sunday 11:30 a.m.-1:30 p.m.
See you at Art & the Vineyard! Are you a writer looking for your fellow writers? 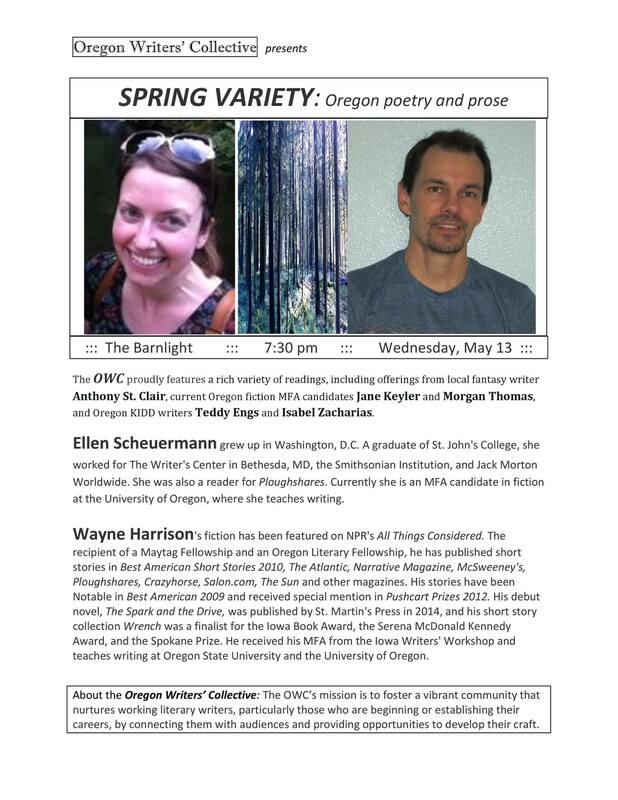 The Oregon Writers Collective (OWC) fosters a vibrant community that nurtures working literary writers, particularly those who are beginning their careers. They meet at The Barn Light (Broadway & Willamette, downtown Eugene), on Wednesdays at 7:30 p.m.
It’s hard to believe that it was only a year ago that I was on the Sword & Laser podcast to talk about the Rucksack Universe. Now, on Wednesday, Apr. 29 at 4 p.m. PT, hosts Tom and Veronica are having me back on to talk about something near and dear to my geeky wee soul: Terry Pratchett’s Discworld. What’s the Sword & Laser? Sword & Laser is a wonderful online book club and regular podcast for science fiction and fantasy fans. Every month they work with their 21,277-member Goodreads group to select a new book to read and discuss. This is one of the few podcasts I always listen to. Right now they’re in the thick of one of Terry Pratchett’s early books, the first Lancre witches novel Wyrd Sisters. Discworld found me while I was living in Edinburgh, Scotland, in 1998–1999. During that time I was a member of the Napier Drama Society at Napier University, and I was cast as Tomjon in a production of Wyrd Sisters. Along with Mort, these were my introduction to the series, and I since have become a voracious Discworld reader. (My wife always knows when I’m reading Discworld because I laugh myself hoarse and have a hard time doing anything else but devouring the book as quickly as possible.) From Granny Weatherwax to Sam Vimes, The Luggage to Moist von Lipwig, I love visiting Discworld and always look forward to going back. Remembering Sir Terry. As you may know, Terry Pratchett passed away on Mar. 12, 2015. He was the author of more than 70 books, with over 40 in his Discworld series alone. I had always hoped to meet the author of many of my favorite books, and whose work and themes have been a huge influence on my own. I won’t get to meet Sir Terry in this life. But I sure as hell look forward to talking about an author and a body of work that is far, far more than funny fantasy stories. Catch our Sword & Laser Discworld discussion. I re-read Wyrd Sisters on Sunday—I believe it was my fourth time reading this book. Will post links and such for the podcast and Google Hangout when they come available. If you can’t make it to the live video Google Hangout on Wed. Apr. 29, at 4 p.m. PT, our Discworld discussion will be online at YouTube and will also be available in the Sword & Laser’s podcast in due course. It’s going to be a fun few weeks, and I hope we get to say hello. We’ll be on stage at the Opal Center for Arts and Education in Cottage, Grove, Oregon, on Sat., May 2, 3 p.m.
Join 3 Eugene/Springfield authors for an evening of science fiction and fantasy! From otters in space and myth in India, to a new twist on Arthurian legend, join Mary E. Lowd, Anthony St. Clair, and Rachael Pruitt at Tsunami Books on Thurs., Apr. 23, 7 p.m. Each author will perform a reading, answer your questions, and then convene for a panel discussion with the audience on science fiction and fantasy. This event is free and open to the public. Tsunami Books is located at 2585 Willamette St., Eugene, or call (541) 345-8986. Learn more at Tsunami’s Facebook Page. Mary E. Lowd is the author of Otters In Space. Her fiction ranges from serious science fiction that explores the intersection of technology, memory, identity, and reality, to fun stories about cats. She’s had more than 50 short stories published and has been nominated 13 times for the Ursa Major Awards. She’s twice received the Cóyotl Award for Best Short Story. Beer writer, globetrotter, and Rucksack Universe fantasy author Anthony St. Clair has walked with hairy coos in the Scottish Highlands, choked on seafood in Australia, and watched the full moon rise over Mt. Everest in Tibet. Anthony’s travels have also taken him around the sights and beers of Thailand, Japan, India, Canada, Ireland, the USA, Cambodia, China and Nepal. He and his wife live in Oregon and gave their son a passport for his first birthday. 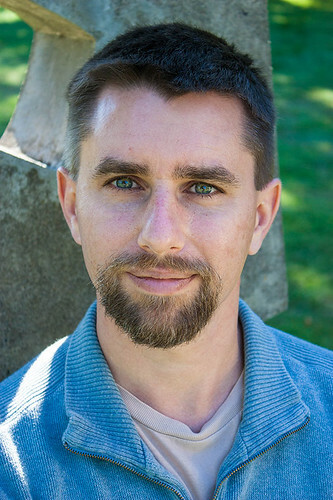 Connect with Anthony at www.anthonystclair.com. Rachael Pruitt is a writer, storyteller, and teacher with a lifelong fascination for Celtic mythology and the Arthurian legend. Her first novel, The Dragon’s Harp, is the winner of the 2013 Visionary Fiction Award from COVR (Coalition of Visionary resources) and the 2012 Winner of Global Ebook Awards for Ancient Historical Literature. Her poetry has appeared in Paradox magazine and her article, “To Dream a Dragon”, is published in the award-winning 2011 writing anthology, Many Genres, One Craft. Rachael has also published nonfiction articles detailing “Myths for Our Time,” a personal mythology process she developed while an Artist in Residence in Oregon. Her second Arthurian novel, The Dragon’s Breath, will be making its appearance in winter of 2015-2016.